Thank you so much for this summary post; I’m a huge Storm fan, though admittedly I only keep sporadic track of the comics, and she up and got retconned, married, and shipped off to another series when I wasn’t looking. I’m playing catch-up and this helped, and I really enjoyed your whole history. Oh, and I posted with Dave Cockrum on Nightscrawlers years ago and I have some scans of his more, er, playful (*cough* raunchy!) original art I’d be happy to share with another true fan if you ping me a mail! 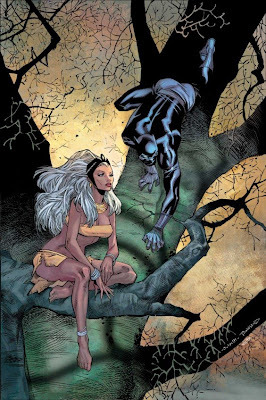 I don’t like Ororo’s marriage with T’challa because it seems forced and I don’t feel any chemistry between them. I kind of prefer Ororo to be with Logan instead because he seems to care about her and I can feel a bit of chemistry between them.